Large, spacious and comfortable family villa in The retreat at Legacy Park. South west facing private heated pool and spa. BBQ equipped games room. Ten minutes drive from Disney. 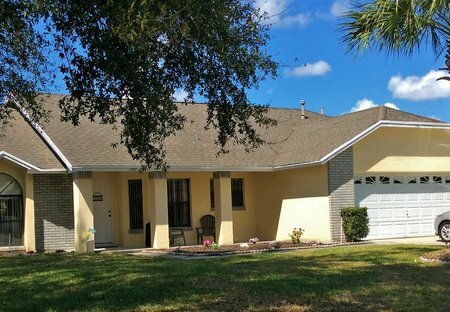 This large detached villa with a pool, located to the southwest of Kissimmee and Orlando, is within 15 minutes drive of all the main Disney attractions. Executive villa with south-facing private swimming pool & spa situated on the Glenbrook Resort, which has excellent facilities. Close to all local amenities. Secluded single storey spacious four bedroom villa in secluded development in Davenport. Private pool with small palm tree lined garden. Only minutes from Disney, shops, restaurants and golf courses. Great base for the dream Florida vacation. 5 bedroom 3 bathroom (2 ensuite) villa with pool, spa, games room WiFi, Disney 15mins and overlooking wooded area. 3 bedroom town house unit at a great price and only 10 miles from Walt Disney World!! Phone, Cable TV & WIFI all included - Grab yourself a bargain so you have more money to spend in the Theme Parks!! Lake View Orlando Holiday Rental Florida Villa near Disney & Golf. Spacious 4 Bed/2 Bath Florida Vacation Home, Private Pool, Wi-Fi, Games Room, TV all Rooms, Gas BBQ, Baby Equipment, Free Calls. New 5 bed 4.5 bath pool villa is located on Solterra Resort, within 15 minutes of Disney, 2 Master Ensuites, Comfortably accommodates 10, BBQ, Child friendly . Ultimate in luxury 4 bed/3 bath villa with 2 master en-suite bedrooms, games room, private large 30ft*15ft pool and spa tub, free wireless internet, safes,phone calls, BBQ . Private paved patio area.